After meeting and agreeing with his new officials at AFC Leopards on Friday, Allan Wanga is set to start a new era with his new club on Monday ahead of the 2012 season .Wanga who is yet to be allocated a team jersey number arrived Nairobi on Friday morning and went for lengthy talks with AFC leopards officials where they sealed the deal on personal terms. He alongside other newly signed players will be unveiled on Tuesday. Wanga joins AFC Leopards from Vietnam based HAGL side where he featured for two years and was a key striker for the side.He chose to come back home despite offers by the club to renew his contract. Wanga now looks forward to a great season with the team next season. He will partner with Mike Baraza upfront in rotation with a strong striking force of Victor Ochieng, Jimmy Bageye and Francis Chinjili among others. “AFC is a great club with a rich history in Kenyan soccer and wonderful fans. It is good to play with and against some of the best players in Kenya, this enhances competition that brings good results, I will put in my best.” He added. He may have joined the den this week but Allan Wanga’s journey to the den dates a long time back. 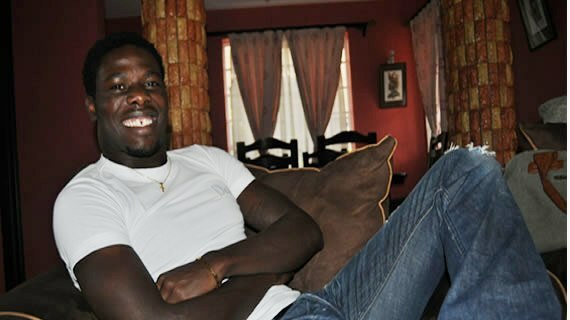 For his education, Wanga shuffled between Kisumu Primary School and his home town school in Butere before joining St. Paul’s High School Shikunga for his secondary education .He was an active footballer then and played in several local tournaments and won countless trophies as the best player. His “professional soccer” started when he was signed by based Lolwe FC. It’s while playing for his side against AFC Leopards Wazee wa Kazi that former international George Sunguti noticed him.Lolwe beat the “Wazees” 5-1 with Wanga scoring four of the goals for his side. Impressed, Sunguti offered to take Wanga to Nairobi for trials with AFC Leopards after consulting his dad. This was in 2006 when football chaos were at their highest. There were two parallel leagues in the country. When Wanga arrived in Nairobi he was shocked to learn that AFC Leopards were in a pre-season tour in Tanzania.Then AFC leopards and Tusker played in different leagues but Gorge Sunguti took him to Tusker to train for two days as he awaits Ingwe to return home from their tour. Mulee asked him to come the following day for a brief trial. Several other players e.g Shikokoti and Jerry Santos were also in for trials but he was more frightened by the big guns then whom he could watch train with the Tusker team. On Wednesday, Wanga arrived for trials and as they say in the Guiness advert “Give a man half a chance and he seizes it”,Wanga grabbed the opportunity and after coming in for the last five minutes durin a friendly match against Mathare Youth, he supplied the equalizing goal for George Midenyo and grabbed the winner for Tusker two minutes later as Tusker won the match2-1. Immediately after the game, Wanga was given forms to sign as a Tusker player.He did not even have to wait for AFC leopards to come back. Wanga also vividly remembers his first Premier League match at the Nyayo stadium a few days after signing at Tusker a humble boy from Butere in Mumias. “I sat on the bench patiently watching the big boys do their thing, Mulee then asked me to warm up but I was not sure whether I really wanted to go into the pitch.In the 83rd minute, the game stopped and I was beckoned in as a substitute. I went on to score in debut league game”. Wanga then went on to bag seventeen more Premier League goals to hand Tusker the title and emerge as top scorer. His goal scoring prowess attracted the eyes of Angolan side Atlético Petróleos Luanda .The scouts kept trailing his performance at Tusker secretly attending Tusker FC matches and sent out a detailed report about his ability to the team’s management. Days later the team’s head coach flew to Kenya accompanied by his technical director. Atlético Petróleos Luanda immediately snapped him up to replace Manchester United bound Manucho and he did not disappoint as he scored 9 goals in 35 appearances. His attempts to sign for Azerbaijani first division club Baku FC fell through after he failed to obtain a work permit.Wanga had a stint at Sofapaka FC before heading out to join Vietnam based side HAGL on a two year deal. He scored in his debut V-League game and went on to notch a total of six goals in 22 appearances. He is now back home to his initial dream team , AFC Leopards ready to deliver and guide the former champions back to their hey days. “It feels great to play at home because I will be close to my family and friends.” He added. Wanga is married to Wife Brenda and together they have one child Jayden.Below Allan Wanga's house in Nairobi.